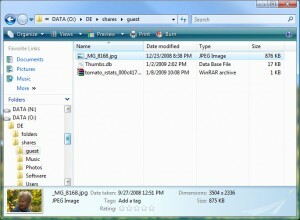 There are various features that are valued as part of the Home Server. For some users it is media streaming capabilities, others like the easy remote access to allow friends and family to access our shared content on the server, and many others are most interested in the ability to back up the PCs and Macs in their home. All of these uses have a single dependency, and that is storage — the ability to store as much data as we want, and to protect the most important data by redundantly storing it on multiple hard drives. The MediaSmart Servers all come with four internal hard drive bays for expansion, but what happens when you’ve filled those bays and need even more room to grow? The Sans Digital TowerRaid TR5M Storage Enclosure offers the ability to greatly expand the available storage of your MediaSmart Server EX470 and EX475. Sans Digital is a provider of high capacity, multi-functional advanced storage solutions and is headquartered in City of Industry, California. They offer a variety of products on their website, from massive 8-drive USB and eSATA storage towers, to portable hard drive enclosures with built-in memory card readers, to Fibre Channel rack mount solutions. Sans Digital has shown a strong interest in making their products known to the community by providing support and information in a positive, outgoing way. Representatives from Sans Digital have an active presence on our forums, been actively trying to research the cause of the EX470 only seeing 4 of the 5 drives in the TR5M, and have been gracious enough to provide me the opportunity to spend some time using one of their storage enclosures. 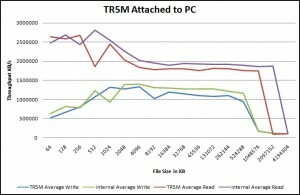 The TR5M supports five SATA hard drives that fit into included slot-loading trays, with LEDs for status and activity. 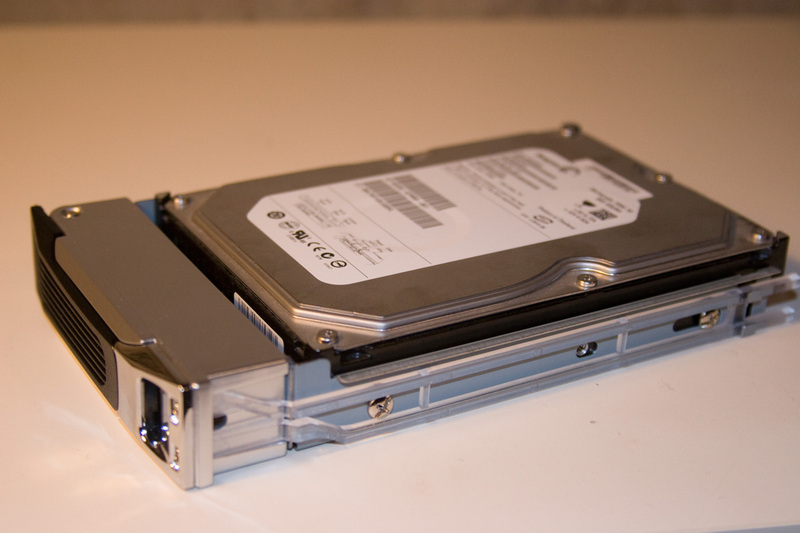 The EX470 and EX475 are known to only support four drives in eSATA enclosures, presumably due to the Marvell 88SE6111 chip used, so the 5th drive would not be usable by these servers. As I mentioned in my recent review, the new EX485 and EX487 don’t support port multipliers at all, and so would only see a single drive in the enclosure. This would likely discourage most users from wanting to use the TR5M with their EX487, though I do offer another usage scenario towards the end of this review. Here are the enclosure specifications from the manufacturers website. The TR5M arrives in packaging showing the enclosure and is securely packed in shaped foam inserts. A small cardboard box contains all the necessary accessories you’ll need to be up and running with either your MediaSmart Server, DIY Home Server, or PC. 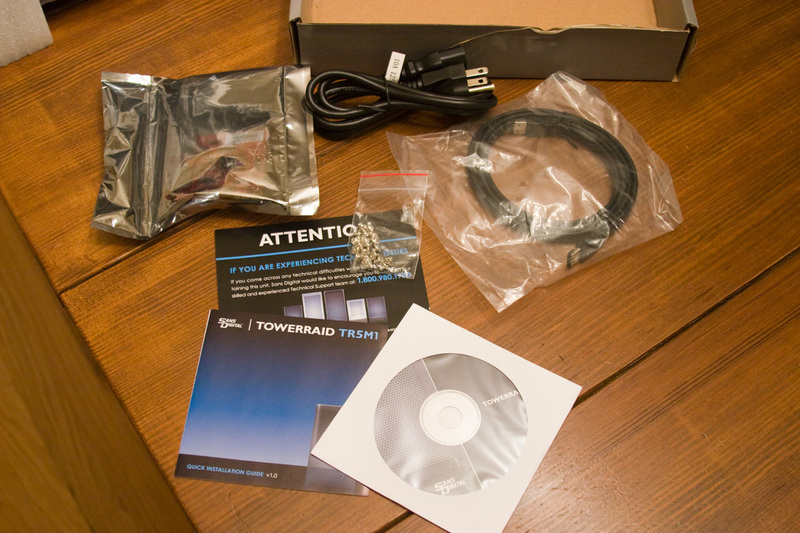 These include the power cord, eSATA cable (approximately 1 meter in length), PCIe eSATA adapter card, CD with software and manuals, and a Quick Installation Guide. Also included is a card with contact information for the Sans Digital support organization, I always appreciate when a company makes it easy to contact them when you need assistance. The enclosure itself is a very attractive gloss black (a silver model is also available) with a mesh metal screen door covering the drive trays. 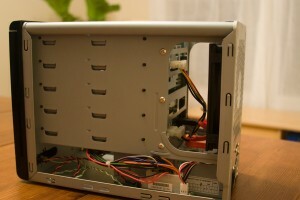 Looking at the rear of the enclosure, we see the power and eSATA connections, as well as vents for the power supply and a single 120mm case fan. There are three thumbscrews that attach the outer case to the chassis which can provide quick access to the inside of the enclosure, however you don’t need to remove the case for normal operation of the server. I should note that during my disassembly of the TR5M, I noticed several markings bearing the CFI logo, which is another vendor of storage enclosures. Stanley from Sans Digital has confirmed that they and CFI are partners. The drive status and activity LEDs are behind this door, which reduces their visibility to some degree. I prefer this, as rapidly blinking lights quickly become tiring to me. The drive trays are easy to use, only requiring a simple slide of the lock mechanism to release the latch arm, and then the tray can be removed from the enclosure. 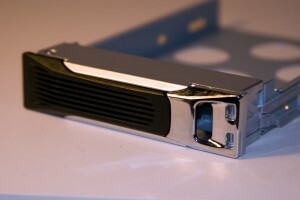 The drive trays do require screws (included with the enclosure) to mount the hard drives. This is an area I would love to see Sans Digital improve and move to a screwless drive tray that’s as simple to use as the ones in the MediaSmart Server. I’ve already mentioned that none of the MediaSmart Servers are able to utilize all five drives of the TR5M, so I’m sure some of you are wondering why I chose this model to review. In all honesty, I had hoped to be able to find some combination of BIOS tweaks and driver version that would allow all five drives to be detected by the EX475, however to date I have been unsuccessful. Since there is only about a $20 price differential between the TR4M 4-drive model and the TR5M 5-drive model it seems a worthwhile upgrade given the variety of uses for the enclosure. When connecting the TR5M to the EX475, there is no need to install the RAID configuration utility as WHS will see the bottom four drives in the enclosure as individual drives for you to install either to the Server Storage pool or as backup drives. Adding a drive to the top (fifth) slot does nothing useful as the drive is never recognized by the EX475. It should be noted that the Windows Home Server Storage Tab is not able to identify which slot of the enclosure each drive is in, so you may want to insert each drive individually, see it recognized in the Server Console, and then label the drive with a marker or label writer. This way you can identify the drive to remove should it fail or you decide to replace it. When connecting the TR5M to the EX487, the bottom drive in the enclosure is recognized and made available for use as part of the storage pool or a backup drive. 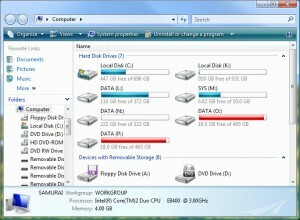 Windows Home Server correctly labels the location of the drive as “External(SATA)”, making it easy to identify in the event you need to remove or replace it. 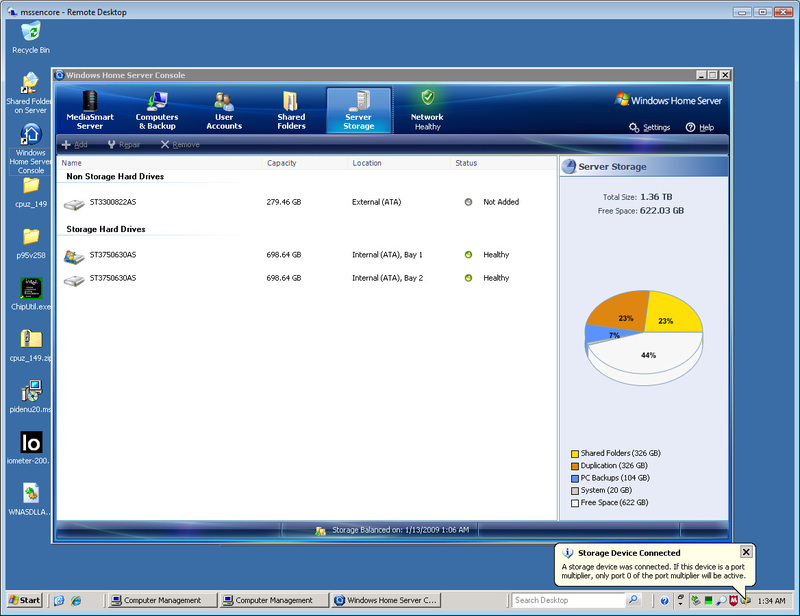 While connected to the server via Remote Desktop, I inserted a drive into the TR5M and noticed the Intel Storage Manager utility launch a popup from the system tray alerting me to the presence of a new storage device and stating that if it was a port multiplier, only port 0 will be active. Usability of the TR5M with the EX487 was excellent, with the system very quickly recognizing the drive in the enclosure upon power on and also when performing hot swap insert and removal. I didn’t have quite as smooth an experience with the EX475, as sometimes the server required a reboot to see the drives in the enclosure, and hot swap did not always work as expected. This behavior was also highly dependent upon the Marvell driver version I used, including some very difficult to troubleshoot reboot cycles I encountered with the latest driver version available via Windows Update. Given the good experience I had with the TR5M attached to the EX487 and my PC, I attribute any strange behavior to the Marvell chipset in the EX475. With regards to hard drives, I experienced no issues with the enclosure recognizing any of the six drives I tested it with. 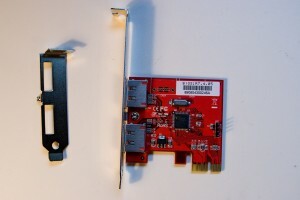 Sans Digital expects that not everyone will be using the TR5M with servers or PCs that already have an eSATA port, so they have included a PCIe x1 eSATA adapter card that features the popular Silicon Images Sil 3132 chip with two eSATA ports. The TR5M Quick Installation Guide instructs the user to install the card, and then install the driver from the included CD, however my Vista system easily detected the new card and installed a driver that worked fine without any additional drivers needed. If you want to use the RAID features of the enclosure, you’ll need to install the SATARAID utility from the included CD. 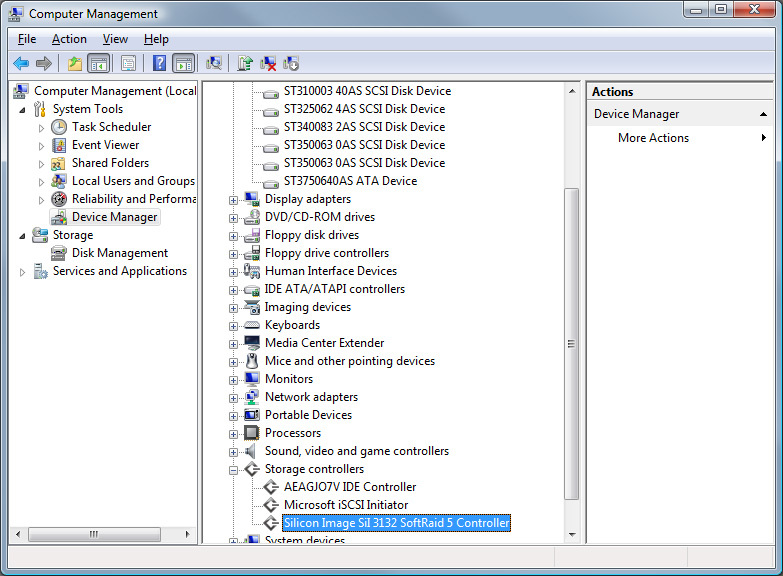 Below is a picture of the card, and Device Manager showing the Storage Controller and five installed hard drives. Since the TR5M includes a PCIe card for eSATA connectivity it can also be used with your PC in a number of ways beyond storage expansion for your MediaSmart Server. One of the most appealing to me is in the event of a significant hardware failure of your Server, you could attach the TR5M to your PC, insert the hard drives from your MediaSmart Server, and access all your stored data. In this way you could recover your data to your PC, or transfer it to a replacement server. I tried this scenario, taking the drives out of my server and viewing them as individual drives in the TR5M and this worked great. 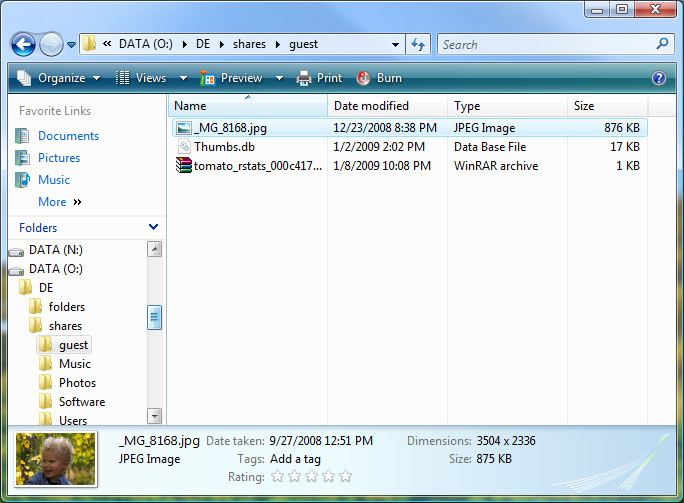 In the following screenshots, volumes K through P are 5 drives (6 volumes) from my personal and development Home Servers that I have inserted into the TR5M, and then using Explorer to navigate the drives to recover a file. While I had the TR5M connected to my PC, I took the opportunity to run some performance tests using IOZone. 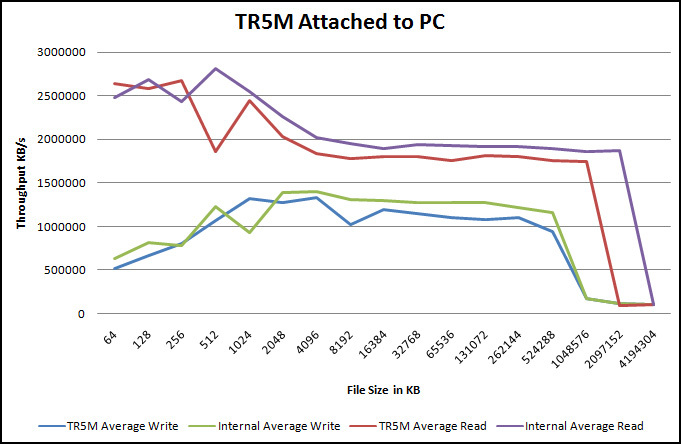 Performance of both reading and writing to a 1TB Seagate drive in the enclosure was only a little behind the performance of the same drive connected internally to my PC via SATA. I do not have a decibel meter so cannot definitively state the sound levels from the TR5M, however I was comfortable with the amount of noise coming from the enclosure. I could easily hear the sound of the EX487 disk drives working over the fan noise from the TR5M. Over the course of the past few weeks that I’ve had the Sans Digital TR5M-B in my lab, I’ve grown quite attached to it. The storage expansion capabilities for the MediaSmart Server EX470 and EX475 are fantastic, even though limitations of the EX470 and EX475 allow only four of the five drives to be utilized the EX485 and EX487 allow only a single drive to be utilized. 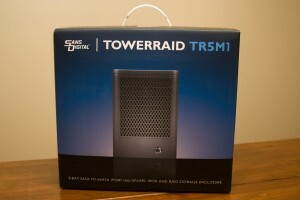 When you also consider the ability to connect the Storage Enclosure to your PC, hot swap ability for adding and removing drives, and high performance of the eSATA connection, I’d be hard pressed to come up with a more useful tool for your home storage needs. 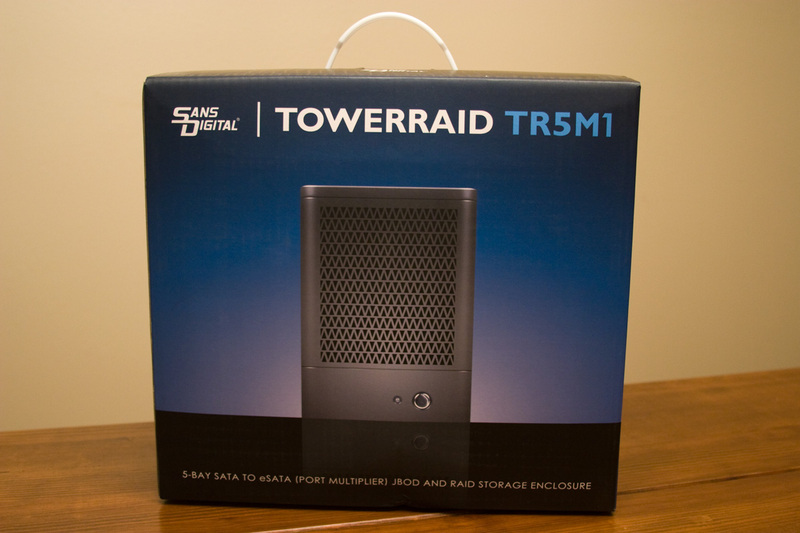 The TR5M and and other Sans Digital products are available directly from the Sans Digital store as well as other retailers such as Newegg.com. This SQA-Ex will also connect to any other Home Server that has a port multiplier enabled eSATA port, ie the HP MediaSmart Server EX470. Alex, can you confirm that the 5 drives are visable and working when the SQA-Ex is connected to the EX47x ? Unfortunately I’ve not had the opportunity to review any of the Tranquil servers so I’m not able to comment on that feature. 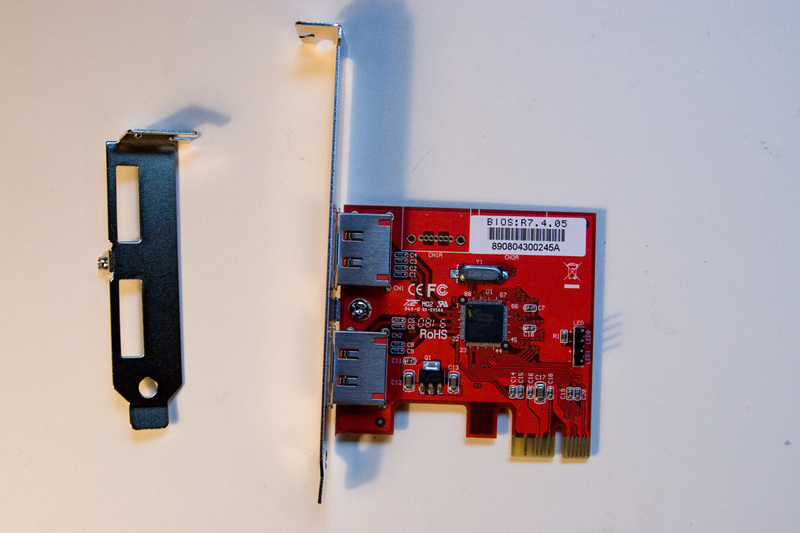 Given my experiences with several different eSATA enclosures and my believe that the issue lies with the Marvell chipset, I do not expect the SQA-5H to behave any differently and would anticipate only 4 drives being visible to the MediaSmart Server. Tranquil, I’d welcome the opportunity to try this! It would be nice if Tranquil could send you the SQA-Ex slave unit to test. In the mean time, I asked Ian Dixon at The Digital Lifestyles ( since he reviewed both systems and Tranquil is nearby ) if he could test this out. He replied that he’ll see what he can do. I’m looking forword to his success. Hi Jason, shorty answer is yes, the EX49x servers support port multipliers and will see all 5 drives of the TR5M. For more details you can see my review of the EX490 and EX495. Does the unit turn itself on and off with the computer, or do you manually have to power the unit on and off? I leave it powered on all the time connected to the server so it’s been a while since I’ve tried this, but I’m also positive you must manually power the unit on and off. I know their USB version of this enclosure does auto-shutdown and power-on with the computer. I wonder if you would be willing to verify this eSATA unit requires manual power-on for me? I would really appreciate it! yup, it requires manual power on (just had to turn mine on two seconds ago). What you could do, and something I was thinking about doing, is getting a “smart strip” power supply. The unique feature of the smart strip is that you can set a few outlets to “turn on” only when the main outlet is turned on. So you would plug your HP Media Server into the master, and when it turns on, it would kick on the other as well. I’m not exactly sure how that would work for sleep mode, but it will work for a full shutdown. I just got verification from the vendor, only the USB version has the Auto-Power Synchronization feature. Thanks! I have just purchased one of these units and connect it to my EX470 and installed 3 drives and these are all shown on another PC but the Hp Homeserver does not recognise any of the drives and it can make it show the server is offline until the storage enclosure is turned off. 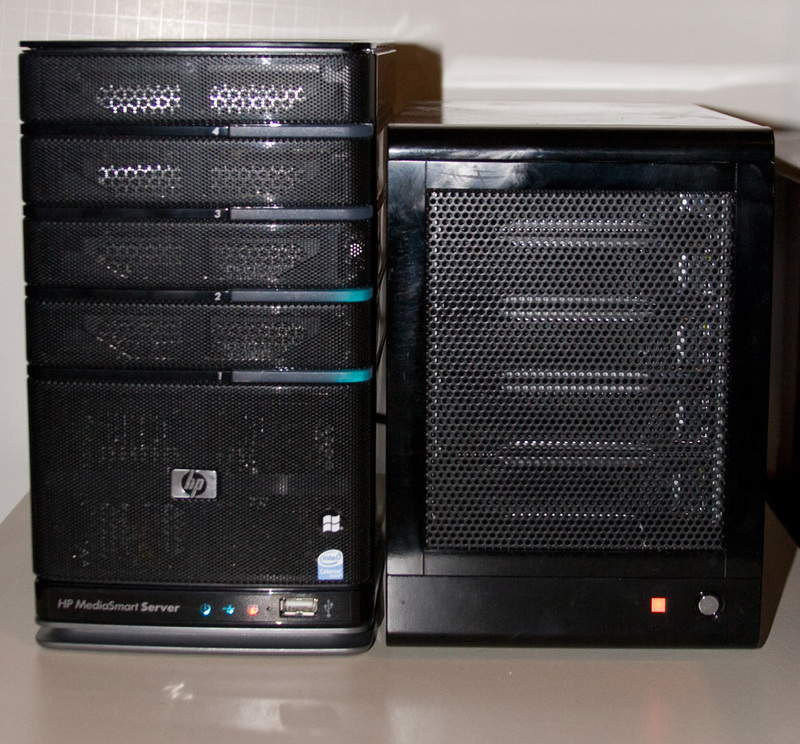 The EX470 will only recognize 4 drives in an ESATA enclosure and not 5. 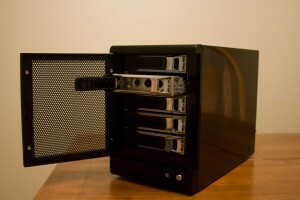 The EX490 and 495 series has a different eSATA multiplier and can use a 5 drive tower. If you have your drives in the top disk slot this may be the problem. I gave up 18 months ago trying to use a 5 drive tower and found Sans Digital 4 drive towers and started using them. I asked Sans Digital to contact this forum to set up a relationship and there is a separate thread for Sans Digital help. Is this “drive hang” possibility unique to this particular enclosure, or would it also happen with most other external enclosures if you have a bad drive? I am looking for a 5 bay enclosure for my EX495 and wondered if this is an inherent problem with using enclosures in general. Could that also happen in you had a bad drive in the internal bay of your Mediasmart server? 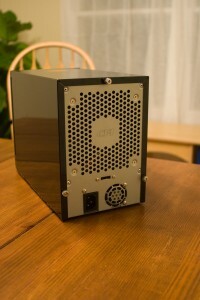 Great review and a great enclosure! If you’re like me and your MSS/TR5M-B are in the living room, upgrade the power supply fan immediately because it whines like nobody’s business and is pretty painful. I upgraded the fan to a Noiseblocker NB XM1 40mm Fan and the 120mm to a Scythe S-FLEX SFF21D. Please note you’ll have to use phone wire crimps, or solder to take care of the wiring for both but it’s worth it. Unit is now just as silent as the MSS with 5 2TB drives humming along! Jason — Thanks for the tips on replacing the fans. I think I will do that for mine too. Mine sounds as if a Jet is about to take off… making way more noise than my EX495. Will definitely be doing a fan upgrade. By the way, did you find the actual process of upgrading difficult? simple but effective. size wise it should fit, reading the instructions it says it can connect to a 2 pin on the mainboard, so it may work without any connectors or adapters. OK now place it flat down in the box again and slide it back in place with lid off to test things. put one screw back in on the plug end to hold it while you plug it in and hit the power switch. it will not come on if you dont have the fan plugged in on the power supply . the larger fan will not come on unless one of the molex connectors are plugged in. Just FYI. Mine sounded much better so now Reverse the order to put it back together. I rate it as 4-5/10 on difficulty only due to working in a small space and ackward angles. hope this helps some. So Far love the unit. 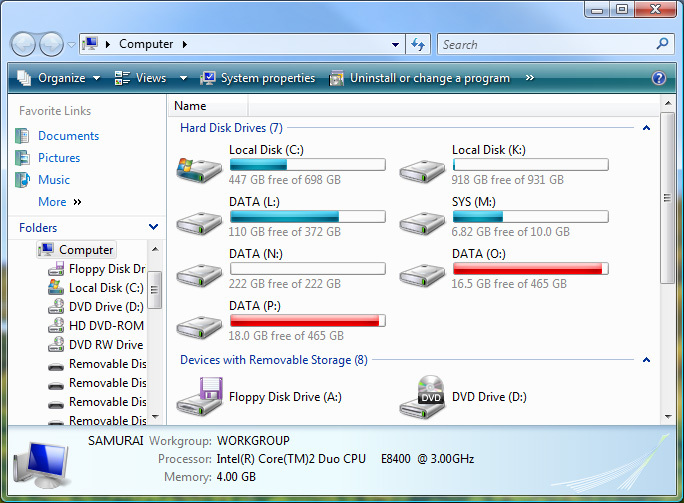 I have the EX490 so can access all 5 drives. just for grins I pulled a drive out while using the system have duplication running and did get the missing drive error. when I put it back in with in about 30 seconds the drive was listed back under the server storage tab and healthy. all errors vanished. running great. I have a TR5M-B & new TR5M-BP. I’d like to silence both! How do you replace the 40mm Power Supply fan? The 40mm fan seems to be encased in the bent together sealed power supply. As you can see problem one is the power supply won’t slide out the side. 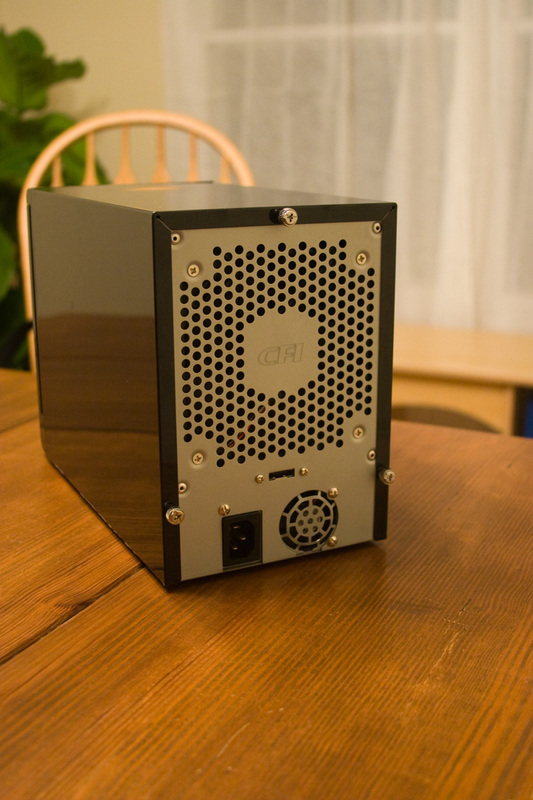 (need 1″ more clearance) I don’t see a way to take apart the case further) Also, looking at the power supply it doesn’t look possible to get inside to replace the 40mm fan. (did you bend/cut into it?) What can I do? He didnt say “how” he did it though. (replied and asked him) The 120mm is easy of course. Is the -B power supply fan seperate compared to the -BP one that is built in as you can see from the video? Just got one of these for my EX495. Works great, but I can’t seem to monitor drive SMART data with any drives installed in the enclosure. 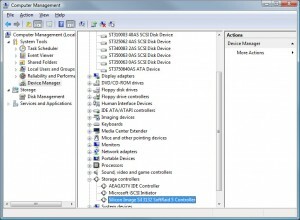 Disk Management add-in shows no temperature for any drive, and says “not supported”. Homeserver SMART shows no data at all. 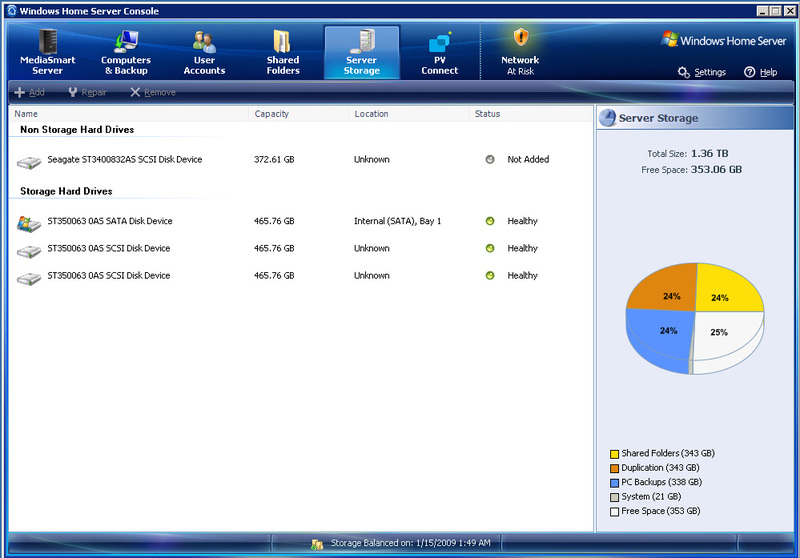 Have the same drives installed in the EX495 (2TB WD EADS, and 2TB Samsung HD204UI) and they show fine. My power supply fan is whining a ton, glad to know the mod isnt too hard. Its works with port multipliers like a champ. How do you get the 40mm fan out of the sealed power supply? This box is great, so far is working fine (I do not shut it off) the fan is a bit annoying it runs at one speed (fast) but is not so loud as to overwhelm my PC’s Fans, still it can’t beat the Stealthiness quiet of the HP EX490. I hope this little info helps you. 1. (1)Mini-Kaze 40mm (p/n SY124010L) This fan is slimmer than the factory fan and requires to use the fan connector from the factory fan..
2. (1)S-FLEX 120mm (p/n SFF21D) This fan also requires to use the fan connector from the factory fan and the cage that clips on the old fan will have a tight fit(cage is not needed to install fan). I don’t want the subtle yet annoying high pitch noise of the power supply fan 24/7. For modding the Power supply fan. 1. It wont come out of the case you have to turn it and undo the screws on the bottom of the power supply to get the top conver off. 2. With the cover off you will see the existing fan is soldered/glued by two wires directly to the power supply. In my case I simply cut them all the way down to ensure they didnt ground. You can get the old fan out by opening the power supply the hard part is figuring out how you wan to get power to the new one. Rig it like I did or resolder the new one to the Power supply. the power supply will come out ,I removed it and did all the work outside the case. it tilts out from the back next to all the SATA connectors just be careful as it is tight. As I noted when i took my little fan out it fell apart since its just a maglev design and when I put it back together it was almost whisper quite. you may be able to just reseat the small fan and fix your problem as well. sorry I didnt take pics but it will come apart for you. Well I think the power supply removal may come down to what Tr5m you have. Personally I have 4, and of the 4 have 3 diffeetn actual tr5m units. The one I had you definetly were not getting that power supply out. good point, I didnt think they would have 2-3 different model but could have. I took the lid off inside the powersupply so you could still replace the fan but will be tight work. After that you’re right, just two screws to take out of the bottom of the power supply after that. Clam Shell opens up, once you see the fan you have to bend the metal back to allow the two metal prongs on the bottom to let go of the fan. I also agree it’s best to use the same wires and just cut/crimp together to the new fan. UPDATE: the TR5M-BP power supply fan only had 6 Volts on the line. Because of this the new 10-12V XM1 44mm fan wouldn’t start unless I helped turn it over once. My work around, was to tap into the 12V line the 120mm Fan uses. I ran the 12V wire back into the powersupply to the new quiet fan. So far so good! It’s pretty whisper quiet now, no more subtly detectable high pitch background noise. I have an EX470 and just bought a SANS DIGITAL TR4M+BNC for expansion. Can I ask if I can add a 3TB drive and have it recognized by the EX470 server? SANS Digital said their enclosure can read 3TB, but I do not know if the Windows Home Server 2003 will. Otherwise, is 2TB the biggest expansion drive I can get for my new enclosure? Thank you Alex for your prompt response! I’ll be ordering a 2TB drive to avoid the issues people had with 3TB. So, with MS essentially walking out on the WHS community I’ve pulled the plug & moved on to Amahi. Everything is going great and I’m excited to be able to extend the file of my EX470. But, I’ve not been able to get the TR5M to work. 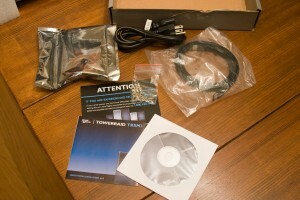 I’m pretty sure I need a Fedora driver for the ESATA card in the mediasmart box but I can’t find any info about it. Does anyone here have any info? Next post: How important is port multiplier support?